The Dickinson Lab is broadly interested in the neural and biomechanical basis of behavior. 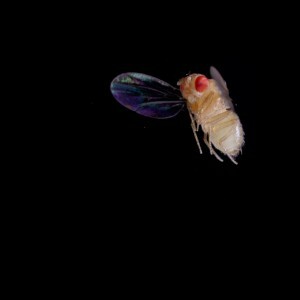 We employ the fruit fly, Drosophila melanogaster as a model system, because it exhibits a rich diversity of innate and learned behaviors and may be studied using state-of-the art genetic approaches. We attempt to leverage these genetic tools by engineering custom instruments that enable the study of behavior from the cellular to ecological level. We are dedicate do interdisciplinary approaches, and the students and post-docs in the lab originate from diverse disciplines including physics, engineering, computer science, and biology. The lab focuses primarily, but not exclusively, on flight behavior. Active flight, which has only evolved four times in the history of life, is a specialized form of locomotion that pushes the envelope of organisms design. Flies, for example, possess the fastest known visual systems, among the most powerful and fast contracting muscles, and a remarkable set of sensory organs including tiny gyroscopes called halteres. Fruit flies are able to travel for over 3 million body lengths per day in search of feeding sites and mates, and can execute evasive banked turns from attacking predators within a fraction of a human eye blink. These and other behaviors motivate both discovery- and hypothesis-driven research projects. Flight behavior is associated with many extraordinary sensory specializations, such as the sonar system of bats and geomagnetic orientation in homing pigeons. The list of sensory specializations in flies is particularly long and includes a fast motion-sensitive visual system, mechanosensory halteres that function as gyroscopes, and antennae that detect mechanosensory, olfactory, and thermal information. All forms of flight behavior including dispersal, foraging, and escape maneuvers, require the rapid processing of sensory cues and the transformation of that information into a motor code appropriate for regulating the motor system. Many past and present projects in the lab focus on the use of sensory information to guide behavior, employing an array of techniques including behavioral psychophysics, in vivo whole cell patch clamp, and 2-photon brain imaging. A key goal in the lab is to understand sensory-guided locomotion in an integrative way that crosses levels of organization (cells to circuits to behavior) and systems (sensory to motor to muscles to biomechanics). Recent work attempts to combine custom techniques for quantifying behavior with state-of-the-art tools for recording from and manipulating neurons. The massive radiation of insects was only possible due to the evolution of specialized muscles that power flight and allow its control. An interesting feature of flies and many other small insects is that their flight muscles are segregated into two classes: so-called power muscles that sustain the basic flapping motion of the wings and control muscles that actuate the rapid changes in wing motion that are required for maneuvers. The lab studies the anatomy, physiology, and function of flight muscle using a variety of techniques including time-resolved in vivo x-ray imaging, genetically-encoded calcium sensors, work loops, and simultaneous high speed imaging with electrophysiology. 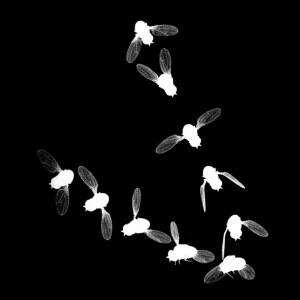 Although a fly can exhibit roughly the same degree of fine motor control as a hummingbird, it does so with roughly 100 times fewer motor neurons. 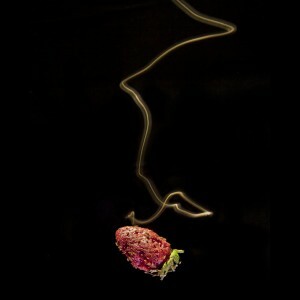 It is not known how such fine motor control can emerge from an extremely sparse set of neurons. One current project is to use state-of-the art in vivo imaging techniques to visualize calcium activation and strain within muscles as well as deformations of the wing hinge during flight. Our goal is to understand the underlying logic of the fly’s motor code as well as the mechanics of the wing hinge and its neuromuscular control. Unlike fixed-wing aircraft, flies generate lift by employing unusual unsteady effects that result from the back and forth motion of their tiny wings. The most important of these mechanisms is delayed stall, which relies on the formation of a leading edge vortex as the wings sweep through the air at high angles of attack. Additional unsteady mechanisms operate during stroke reversal due to the rapid axial rotation of the wing and the interactions between the wing and its wake. The laboratory studies these phenomena using a combination of high speed videography of real flies, force and flow measurements on large, mathematical simulations, and a dynamically-scaled robot called ‘robofly’. Past work was focused on uncovering the basic aerodynamic mechanisms that enable flies to generate sufficient lift and thrust to fly. Recent work focuses on the aerodynamic basis of active flight maneuvers and control reflexes. Another goal is to link our understanding of aerodynamic mechanisms with the muscular-skeletal mechanics that permit their control. Although flying Drosophila are not known to exhibit social behavior, they do engage in complex interactions such as courtship and aggression while walking on their feeding sites. In collaboration with the Perona lab at Caltech, we have worked in the past to develop robust machine vision and learning-based strategies for tracking the movements and classifying the behavior of flies (e.g. ‘Ctrax’ and ‘flydra’). The use of these and similar techniques has helped foster the discovery of many more examples of social behavior among groups of flies. To investigate these behaviors in more detail, we have also developed a simple fly robot ‘flyatar’ that may be programmed to interact with a real fly in real time. 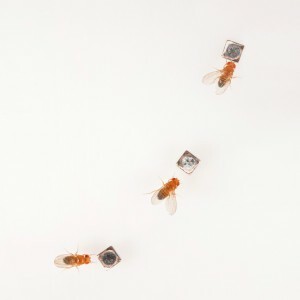 Despite the robot’s simplicity, male flies will nevertheless chase, orient, and sing to a tiny fly-sized robot. Because the robot fly may be coated with pheromones, the instrument is particular convenience in teasing apart the relative role of visual and chemical signals in fly-fly communication. The laboratory is also interested in developing new techniques for tracking the social behavior of flies on natural rots in the wild. Dispersal is a fundamental behavior of nearly all motile organisms, as it enables them to relocate to areas of resource abundance. Despite its ecological and behavioral importance, the neural mechanisms underlying dispersal and navigation are poorly understood. Mark and re-capture experiments performed in Death Valley by Jerry Coyne and colleagues in the early 1980s suggest that fruit flies can maintain a nearly constant heading for over 10 kilometers as they disperse. 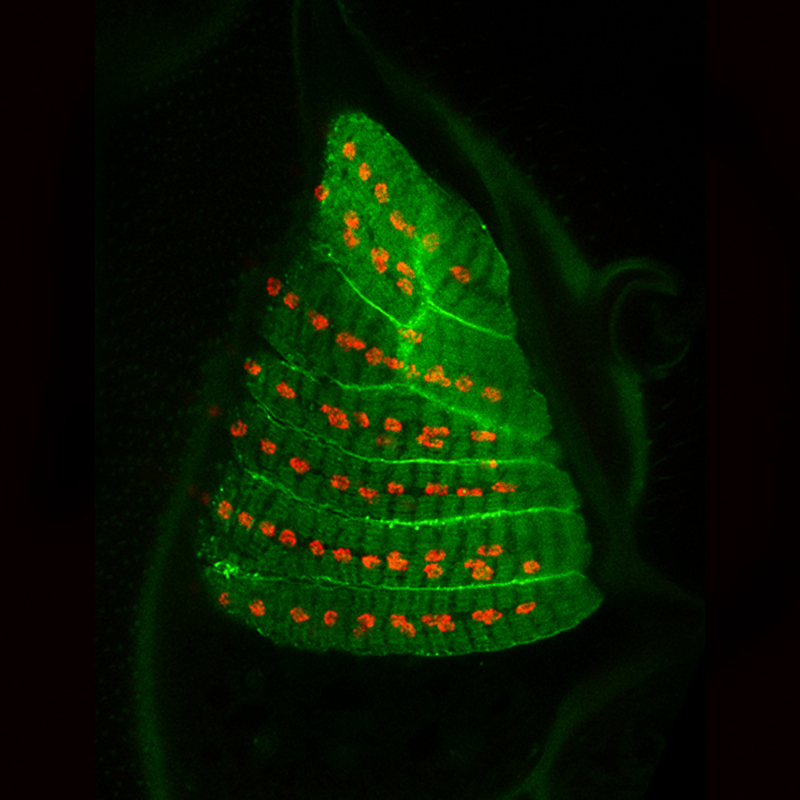 Recently, our laboratory demonstrated that fruit flies possess the ability to navigate using the pattern of polarized light in the natural sky. By combining experiments in laboratory flight simulators with genetic tools, we are attempting to rigorously characterize navigation behavior and elucidate the neural pathways that link the detection of sky features to the animal’s motor system. The research will open the way for investigating many critical features of navigation such as time-compensation (the internal calibration that corrects for the motion of the sun) and imprinting (the ability to choose an arbitrary compass heading at takeoff). Our goal is to elucidate the neural and behavioral mechanisms that allow animals to navigate using compass cues from the sky.